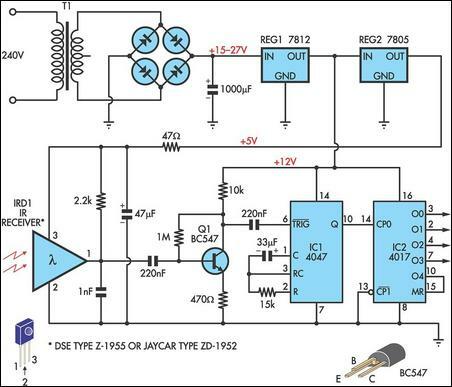 This circuit enables any infrared (IR) remote control to control the outputs of a 4017 decade counter. It's quite simple really and uses a 3-terminal IR receiver (IRD1) to pick up infrared signals from the transmitter. IRD1's output is then coupled to NPN transistor Q1 via a 220nF capacitor. Transistor Q1 functions as a common-emitter amplifier with a gain of about 20, as set by the ratio of its 10kO collector resistor to its 470O emitter resistor. Q1 in turn triggers IC1, a 4047 monostable which in turn clocks a 4017 decade counter (IC2). Basically, IC1 provides a clock pulse to IC2 each time a remote control button is pressed. If you don't wish to use all 10 outputs from IC2, simply connect the first unused output to pin 15 (MR). In this case, only the first four outputs (O0-O3) of the counter are used and so the O4 output is connected to pin 15 to reset the counter on the fifth button press. Power for the circuit is derived from the mains via a transformer and bridge rectifier which produces about 15-27V DC. This is then fed to 3-terminal regulators REG1 & REG2 to derive +12V and +5V supply rails.